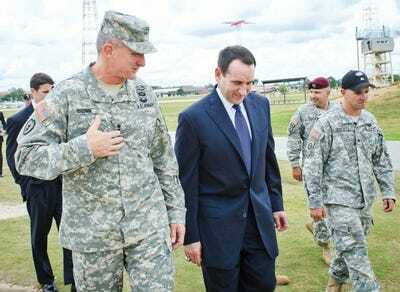 Kristian Ogden/US ArmyDuke coach Mike Krzyzewski chats with Maj. Gen. Robert Brown, his former player at Army, during a visit to Fort Benning, Georgia on September 28, 2011. Mike Krzyzewski is one of the greatest basketball coaches of all time. He’s a four-time national champion with the Duke University Blue Devils, and he’s coached two gold medal-winning US Olympic men’s basketball teams. But in October, Coach K offered his thoughts on an altogether different and far higher-stakes conflict than anything that could plausibly unfold on a basketball court: the US-led campaign against ISIS. Krzyzewski, West Point class of 1969 and a former US Army officer, opined on the state of American anti-ISIS efforts during an acceptance speech for the Association of the US Army’s George Catlett Marshall award, according to video published by Josh Rogin of The Daily Beast. The hardwood legend used a series of basketball analogies to explain how he believed that President Barack Obama wasn’t using all of the resources at his disposal to fight the jihadist extremist group, which has taken over a nearly Belgium-sized chunk of Iraq and Syria. “I know it’s upsetting to many of you when you hear ‘no boots on the ground.’ It upsets me too,” Coach-K said, likening the administration’s aversion to committing combat troops to not “using your best players” in a crucial game. “You’re not gonna tell the coach you’re not gonna play Grant Hill, JJ Reddik, Laettner,” he said, referring to three of Duke’s former star players. Elsewhere in his remarks, he compares trying to fight ISIS without “boots on the ground” to playing Spain and voluntarily sitting Lebron James and Kobe Bryant. Krzyzewski doesn’t sketch out an alternative anti-ISIS strategy, and was only generally arguing that the mission should have a more aggressive ground component. As it is, the US has around 1700 ground troops in Iraq, most of which are working in an advisory, embassy defence, and intelligence-gathering capacity. There are a lot of ways to pick at Krzyzewski ‘s logic. A basketball game takes place in the perfect vacuum of athletic competition, unlike war, which occurs in an endlessly fluid and uncertain social and political environment. There are no allies to assuage, local proxies to arm, enemies to win over, or domestic constituencies to reassure before a star player can enter a game — at least not in the same sense. But his audience seemed to appreciate the comparison anyway. After all, Krzyzewski has a far more extensive military background than most major American sports figures: he coached and played at West Point, and served in the Army as well. His analogy also included some heartfelt appreciation of the armed forces. “The fact that we don’t play home games here is the result of having boots on the ground,” Krzyzewski said to applause. “I wanna thank you for the countless times your boots have been on the ground and as the result it’s given me the opportunity to live in a free country to do what the Hell I want to do,” he said later in the speech.